Sitzmark Ski Club of Milwaukee, Inc. - Monthly Membership Meeting - Beach Party with the band "Floor It"
Monthly Membership Meeting - Beach Party with the band "Floor It"
BEACH PARTY WITH THE BAND "FLOOR IT"
Vail trip participants receive free entry into the meeting. Must bring your lift pass or lift ticket. Floor It...the name says it all! We're a high-energy, white-hot rockabilly, surf instrumental & 50s/60s rock and roll act playing music that'll rev your engine! Marvel at the dead-on interpretations of razor-sharp rockabilly from the Sun Sessions, Johnny Cash, Eddie Cochran, Carl Perkins & today’s master of the genre, Brian Setzer. Dance to the biggest hits of early rock and roll: the Beatles, Buddy Holly, Ritchie Valens, Ricky Nelson, the Everly Brothers, Roy Orbison, the Legends, and more. Revel in guitar-shredding surf instrumentals, like those from the Ventures - brought back in the movie Pulp Fiction - others made new by the Los Straitjackets and some Floor It originals. 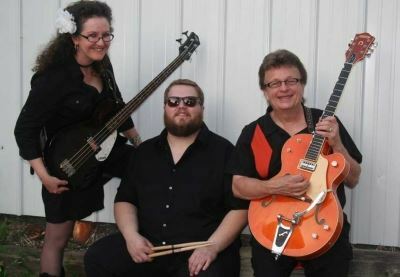 Floor It has been a featured act at the biggest rockabilly festival in the Midwest - the Symco Hotrod & Kustom Weekender – as well as the Potawatomi Casino, Wisconsin State Fair, and all over Milwaukee. We put the muscle back into some of the best music ever made!